Hi everyone! I’m sure those of you who are using S2R regularly have already noticed the changes I’ve recently made in the user page interface. I’m talking about the “Recommend to other readers” buttons in your “sent recently” lists and about “Recommended links” – the list of articles recommended by other readers. So, what’s the purpose of adding those buttons and the list? The idea is very simple – those buttons should help us to notice and highlight the content which really worth our attention. We all know, Internet is oversaturated by texts – blog posts, advertorials, etc. and only a very small portion of that content really worth reading. That makes quality content even more valuable. And I think that’s a pretty nice idea to let us share the links to the texts we enjoed reading with each other. That’s exactly what “Recommend” buttons do. 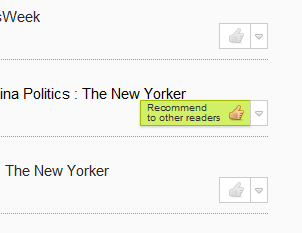 In short, if you really liked an article you’ve sent via SENDtoREADER, don’t hesitate to click “Recommend”. I’m sure, other readers will be thankful. And please, don’t worry about your privacy, all recommendations are anonimous. P.S. I also hope you liked my idea to move command buttons (“Resend”, “Share on Facebook”, etc.) from the annoying high-contrast ribbons to the traditional popup menus. Howc do I hange my password? Please read the How-to/FAQ page: http://sendtoreader.com/how-to/. not to burst your bubble, you’ve done loveley work but if the document isn’t sent from an allowed address amazon won’t send it to the kindle; you’ve neglected to allow us to set the sender address in the android app or the website. That’s why I’m asking you you to add @sendtoreader.com address to the list of allowed ones on amazon. I guess that’s not harder to add an already allowed address to the settings page on sendtoreader.com. In any case the result would be the same.